After introducing this wonderful essential oil, all my symptoms from Chronic Lyme disease are finally clearing! Thyme (Benchmark) essential oil is helping me get rid of Lyme disease! I use it in a lotion along with a few other essential oils and am blown away at how much better I feel. If you are feeling ill, I am confident this will help you also. Let me tell you a very short version of my story. I contracted Lyme disease somewhere in the 90's. Just like so many others, I never knew I had been bitten. To tell you the truth, I never felt any of the beginning symptoms. What I did experience closer to the year of 2000 was insomnia and emotional instability. I just thought that I was working through something. Then in October 2013, I began to notice some weakness in my legs while doing yoga. I didn't think a whole lot about it until the weakness became accompanied by extreme pain. It hurt so bad to walk that tears would stream down my face while I was walking. Then the rest of the symptoms set in and soon I was in a wheelchair not able to do much for myself. I lost weight very rapidly and at one point was as low as 75 pounds. I called an herbalist friend of mine who owned an herb company. We talked for about an hour and came up with an herbal protocol. I started it and felt better. About a year later, I met a man who grew medicinal mushrooms and was immediately attracted to them. I switched to using mushrooms as my main ant-infective. Again, I started to feel better. In the year of 2016 nothing was really helping. I was better than I was at the beginning but was not progressing. I was still terribly underweight. In October, I received an email asking me if I wanted to be part of a Lyme trial being run out of the UK. 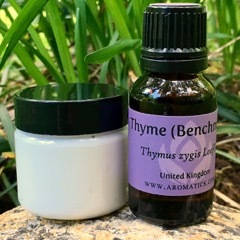 The trial used Thyme (Benchmark) essential oil as the main ingredient. I was told by the woman running the trial to expect to use the blend for 9 months. Her experience was that after that amount of time, everyone that she had worked with felt 100% better. I am now beginning my sixth month and am able to do things that I never dreamed possible. My weight is normal. Not only am I out of the wheelchair, but I can even go on short walks. I know that there are a lot of Lyme treatments out there. This is the one that is working for me. And the wonderful thing is, I have never had a herxheimer reaction from using this lotion. Nor has anyone in the Lyme trial. Although my personal experience with this blend has been with Chronic Lyme disease, it is not limited to only Lyme disease. This same blend is being used for many different chronic and even acute conditions. If you have Lyme and this in any way resonates with you, please give me a call. After having suffered so much with this illness, I never want another person to have to suffer as much as I have. I truly believe I can help. You can reach me at 828-862-8806.